Jens Brand (born 1968 in Dortmund) studied fine arts at the Münster Academy of Fine Arts (1988–1994). Inspired by Phill Niblock and the artistic environment at Paul Panhuysen’s Het Apollohuis, he turned to experimental music and sound art. Since then, he has created a large number of installations, music performances, and cross-media works. In 1992, he began an intensive collaboration with Waldo Riedl and founded mex e. V., an initiative to promote cross-media and experimental music and media projects. Jens Brand has been awarded many fellowships and has received many commissions to create compositions. He was a fellow at Villa Aurora in Los Angeles in 2003 and taught at the Münster Academy of Fine Arts in 2004. 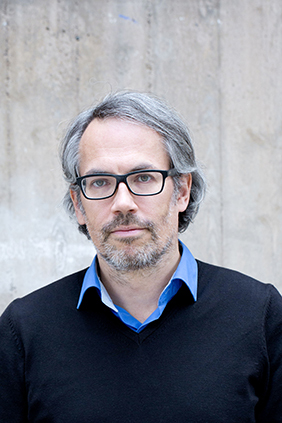 Since 2013, he has been a professor at the Kunsthochschule Kassel. Jens Brand has lived and worked in Berlin since 2010.